Truck Weigh Scales are being used to weigh rubble being supplied to SA’s Northern Expressway project. The truck weigh scales were installed by Accuweigh and have a high work rate with trucks being weighed every 35 seconds during each 9 hour period of daily operation. 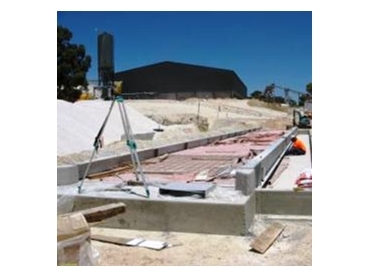 The reinforced concrete foundations of the truck weigh scales were designed for a shallow pit installation with the truck weigh scales deck close to ground level for fast and easier access by heavy trucks exiting the quarry. They measure 26m x 3m and are fitted with 8 heavy-duty load cells and a single digital weight indicator. The truck weigh scales were later fitted with a Driver Control Station (DCS) running AASoftware’s Truck weigh scales Software for processing all truck weighing transactions and to supply full product reporting by truck, product and destination.